J.D. Power released a report on Thursday looking at which of the big four major U.S. carriers provide cellular service with the fewest lost calls, slow downloads, failed texts and other common issues. As usual, the survey says Verizon has the highest mobile network quality. Verizon’s network had the fewest connection problems among the big four carriers in all six geographical regions that J.D. Power looks at. AT&T came in second place, taking the runner-up spot in all six regions. Last year, T-Mobile started to take the second-place slot from AT&T in areas such as the Northeast and West. This year, though, AT&T reclaimed it in those regions. One way to explain that: Last summer, when the previous report came out, T-Mobile had been in the process of building a massive network expansion. However, T-Mobile’s been adding millions of subscribers since then, and the reduced network quality could be because its network is starting to show signs of saturation. In the northeast region, for instance, Verizon subscribers can expect to see 11 problems per 100 connections; AT&T subscribers will see 13 problems per 100 connections; and T-Mobile lags behind with 16 problems per 100 connections. Last summer’s J.D. Power report suggested that T-Mobile only had 12, and AT&T had 14. Verizon stayed steady with 11 problems per 100 mobile interactions. In the other five regions, the situation is similar. 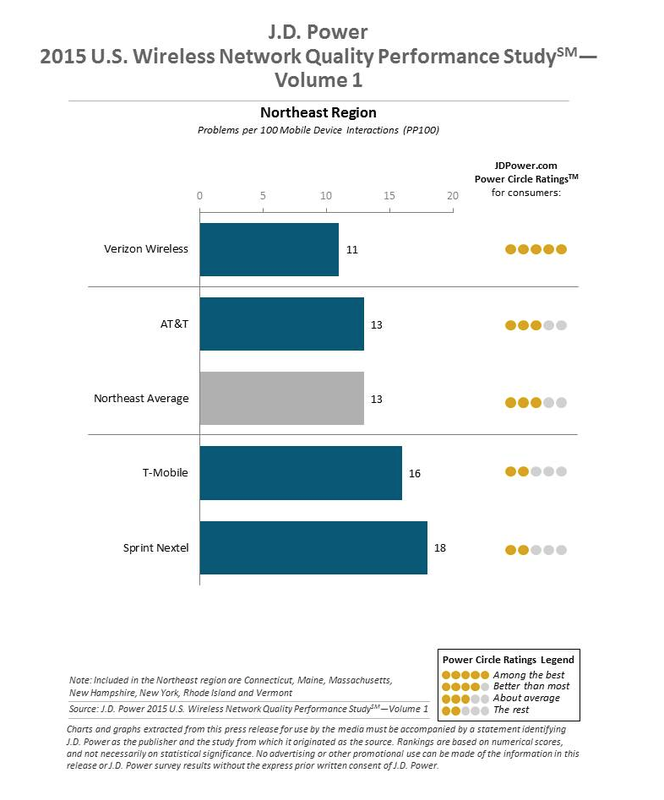 Verizon even improved its mid-Atlantic performance to take the top spot back from AT&T there. Overall, there have been more issues with network quality in the past six months than before. Out of every 100 network connection, across all four carriers, there is a problem with 13 of them. Last year saw an average of 12 issues per 100 connections. Network quality isn’t the be-all and end-all for carriers, though. J.D. Power administers surveys looking at customer service as well, and T-Mobile came out on top of that last summer. Charts for all six regions are available from J.D. Power. ATT is so horrible, I honestly think they paid of JD to get this rating… there is simply no way humanly possible based on my personal experiences that they could get anything but last place in anything customer service related.